Width; 1.85 metres (mirrors folded in). On-the-road from £35,650. with 90 B.H.P. 1.3 litre Multijet Turbo diesel engine. 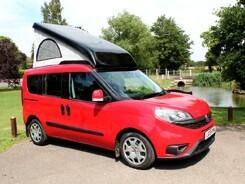 Or, new conversion on a 2 year old Doblo approx £33,500. Two single beds or one double, four belted travelling seats. Electric Induction hob cooking system complimented by electric oven/grill/toaster running from built in Inverter. Two stylish storage pods that lower down from within the roof giving 210 litres of storage (that’s equivalent to three good sized suitcases!) ideal for clothes. Price inc. V.A.T @ 20%, on the road charges and delivery to your home anywhere U.K. mainland, 2 years Fiat warranty (or 120,000 miles). 12 months Wheelhome warranty. See October 2014 issue of MMM magazine for a road test of the Skurry. See August 2013 issue of Which Motorhome magazine, it carried an "Economy test" of a variety of campers, including the Skurry. "If we'd broadened our economy remit to include aspects of the conversions, too, there's little doubt this (the Wheelhome Skurry) would have been our overall winner"
"It's also true to say the Skurry has almost infinitely more storage than any of it's same-size rivals"
"Arguably, every vehicle in this month's showdown has a fair bit of character. It's just the Skurry has more than most". 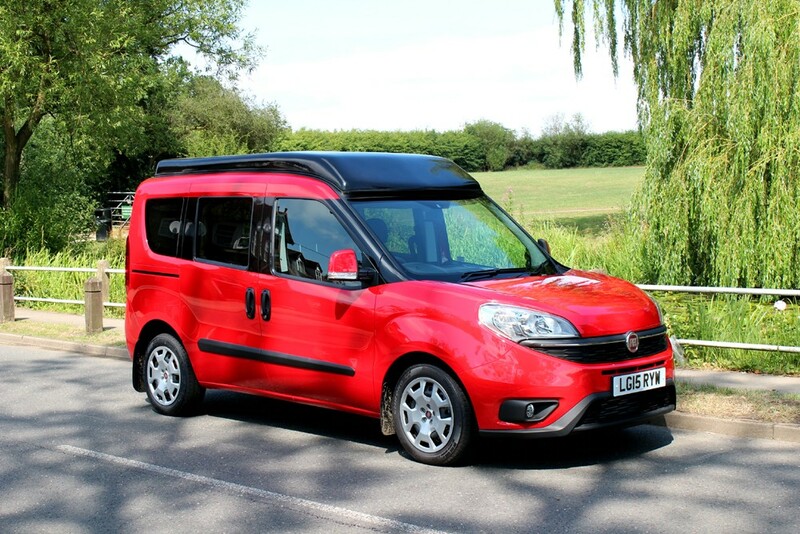 SKURRY on Fiat Doblo Combi (short wheelbase) with a revolutionary electric cooking system; Skurry is a gas free camper! 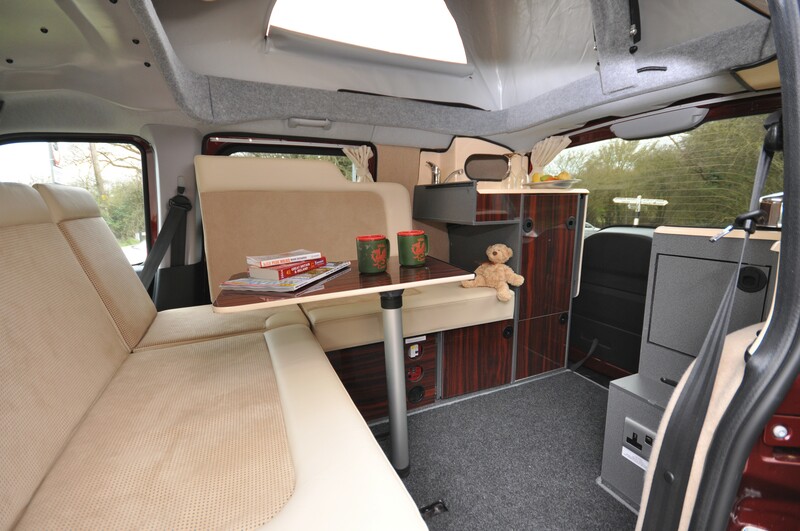 The Skurry is an extremely practical dual-purpose camper and every-day car with four belted travelling seats, delivering comfort, convenience and truly innovative design combined with a range of latest Euro 6 engines (automatic option) giving exceptional fuel economy(48+ mpg). Well under 2 metres high so height barriers are no problem! Skurry has two single beds or one double, four belted travelling seats. Skurry has a rather special, and unique to Wheelhome, electrical cooking set-up which includes one built-in Induction hob (use a steamer on top of a saucepan to cook vegetables and potatoes) plus a 230 volt power outlet from an Inverter. Also an electric oven/grill/toaster, two stylish storage pods that lower down from within the roof giving 210 litres of storage (that’s equivalent to three good sized suitcases!) ideal for clothes, very high capacity auxiliary battery. 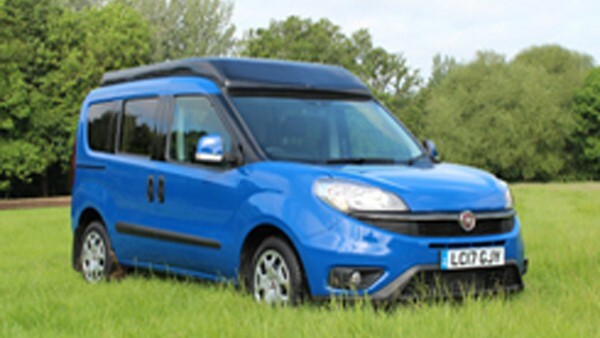 Vehicle specification; Skurry is based on the very latest Fiat Doblo Combi with a Euro 5 1.3 ltr Multijet turbo diesel engine producing 90 BHP. 48+ mpg. Also available 1.6 ltr (45+ mpg). The Skurry will cruise comfortably at 60- 70 mph, or more, if you wish. Standard features include; Anti-lock brakes (ABS) with EBD. Power steering with fully adjustable steering column. body coloured bumpers and mirrors. Electrically operated cab windows and door mirrors. Heated door mirrors. Remote control central door locking. Tailgate with heated rear window and wash wipe. Radio with CD player. Driver’s seat height and lumbar adjustment. Driver’s and front passenger airbags. Fuel/trip computer. Skurry has been thoughtfully designed to retain the original Fiat rear double seat, complete with three point seat belts and headrests. Child seats are no problem as Skurry has Isofix Upon arrival on site, both cab seats and the rear double are slid forwards, an easy 30 second job. You then have a superb spacious lounge - complete with Chaise Longue day-bed! Camping spec; Skurry has a rather special, and unique, electrical cooking set-up which includes one built-in Induction hob and a 9 litre mini oven/grill mini oven/grill. The built-in Induction hob works completely independently from the campsite 230v hook up. This is achieved via an inverter (a device that cleverly changes 12 volts from the high capacity auxiliary battery into 230 volts). Let’s say you are parked up in a lay-by for lunch; This super system allows you to boil a kettle, heat some soup, or make a tasty toasty sandwich using an electric sandwich maker, kettle or mini oven/grill. It only takes approx 30 mins of motoring to put the power used back in the batteries. This is achieved because Skurry has an enhanced battery charging system which ensures the vehicle alternator re-charges the auxiliary batteries 4 times faster than normal. Skurry offers increased safety by having no gas at all, no naked flames, no smell, smart - and easy to clean. What’s not to like! Skurry has an on-board 10 litre fresh water supply which delivers water to the sensibly sized sink and drainer with moulded in splash back, complete with worktop extension panel contributing to very generous worktop surfaces. Easy access top loading slide out Waeco fridge. Electrically operated elevating roof incorporating large zipped vents. The roof can be lowered whilst wet and dried/aired later. Mains 230 volt hook up with outlet, RCD safety device, Battery charger. Enhanced and automatic, auxiliary battery charging from the vehicle engine/alternator. Skurry is well served with three LED interior lights. Fitted and lined curtains with press studs to hold neatly in place. “Surprising, delightful, innovative, unique… packed with clever ideas designed to make camping in miniature comfy and convenient”. - Which Motorhome.